One hundred years of Wyoming Football was the theme for the season as Wyoming Athletics and Wyoming Alumni Association joined forces to celebrate the longevity of the sport at Wyoming High School. Festivities ensued all fall with much fanfare for all involved. But little did they know the team’s motto was “15 weeks”, not 100 years, with high hopes this was the season to play for a full 15 weeks to reclaim the State Championship Title that Wyoming last held 41 seasons ago. Mission accomplished, team! 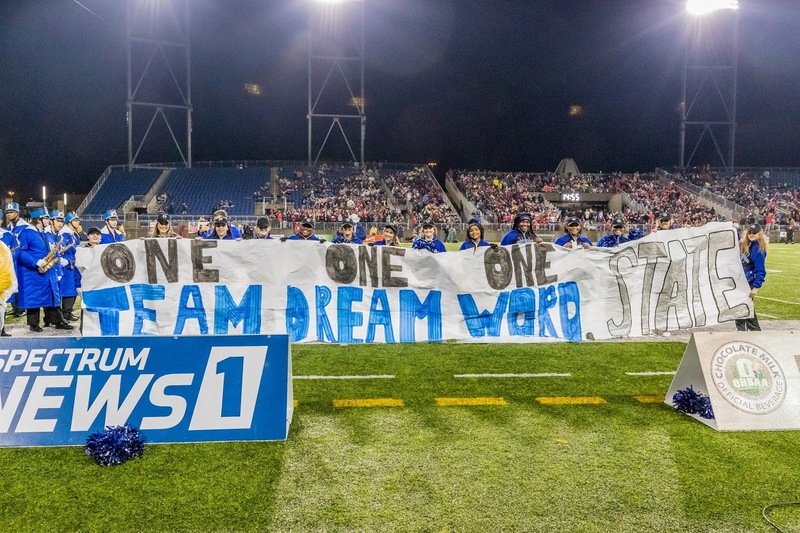 The story has been told and celebrated many times now, but here is a new glimpse into the season that was 15 weeks long, as part of the 100th year, culminating in being named the 2018 State Champions. Many thanks to the team, the marching band, the cheerleaders, the coaches, the parents, the student body, the fans, and the community for ALL being a part of the season that was Wyoming High School Football 2018. The Wyoming High School 2018 State Champion Football Team celebrated after their victory over Girhard High School in Canton, Ohio. Photo by Rod Apfelbeck. Besides clinching the state title, what moments from the season stand out the most to you? Beating Indian Hill twice and accomplishing our team goals. What word or phrase best defines this team? Years from now, what do you think you will cherish most about being a member of this team? The memories of this journey and everyone who was a part of it – coaches and players. What would you like to share with the Wyoming Community about their enthusiasm and support this season? Thank you for the support at all of our games, rain or shine, and no matter the distance. What other stories from the season/experience you would care to share? One of our assistant coaches said at our pre-season defensive dinner, “If we win State, you can all go to my wedding.” Well, we won . . . The team was recognized at the Cincinnati Bengals game. The moments that stand out to me would have to for sure be beating Indian Hill twice this year! I will cherish the relationships I have built with all my teammates and coaches the most. The relationships I have built over the last four years will last my entire life. It is so much bigger than football we are a family, and we will always hold a special place in each other’s hearts. The community support over not only this season but the past four years has been unbelievable. It means so much to run out onto the field every night in front of the whole community and wear the name Wyoming across my chest. One of my favorite stories would have to be after the regional finals win against London when we were dancing in the locker room! Wyoming High School Football Coach Aaron Hancock was congratulated on the big screen at the Bengals game. 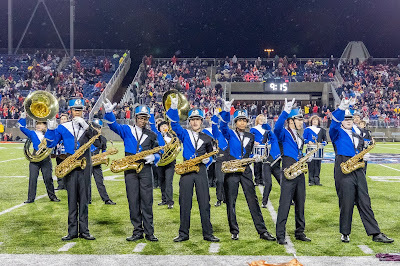 I think that the moments from this past season that stand out the most to me were just the little things, like the bus rides to and from away games or cadencing into the stadium because despite how insignificant they seem to all of us in band at the time, they're really the things that most of us are going to miss since the season's over and us seniors are done. What word or phrase best defines this band? To me, the word that best describes this year’s marching band would be dedicated, because no matter what the weather was or how we were feeling we always went to every game to support the football team and no matter what they could always depend on us to be there. There were definitely moments when we had to push ourselves through bad weather and cold temperatures, but no matter what we were there. Years from now, what do you think you will cherish most about being a member of this band? Honestly the entire experience of being in marching band here at Wyoming is one that I will cherish because it really helped me to develop as a person and as a leader, but it also allowed me to make strong bonds and friendships with people who I might not have ordinarily talked to if I wasn't in band. To the Wyoming community, I want to thank everyone for all of the support this season. Without help from the community, the band might not have been able to do a lot of things, including going to the state game which is a memory I'm sure we all will cherish. It's always been encouraging at games to hear people's comments and praise about our hard work with our show and our music, and I'm so grateful for the enthusiasm in what we do. The Wyoming community came out in large numbers to cheer on the football team caravan as they departed for Canton. This season overall was one of the most outstanding and memorable parts of my high school career. Besides clinching the state title, the most memorable part of the season for me was our big win in overtime against Indian Hill. Just a week or so before this playoff game, we had beaten Indian Hill 37-7. Going into this playoff game, I was excited for another easy win. However, as the game got close and I began to worry for our playoff run, the boys came through and won in overtime. Although I had my natural anxieties with a close game, I had all of my faith in our football players to continue on in the playoffs and win STATE! What word or phrase best defines this squad? One word that I would use to describe the 2018 football cheer squad is “family”. Throughout my experiences at Wyoming, I have played many sports and joined numerous clubs. However, nothing has ever compared to the cheerleading squad from this year. These girls are not only my best friends, but they are my sisters. We spent hours on end practicing to cheer, chant, and dance for the crowd all season, and I could not have asked for a better group of girls to grow close with during my senior year. Years from now, what do you think you will cherish most about being a member of this squad? Looking back on this football season, I will always remember the state title. However, the title itself is not the memory I will cherish. Most of all, I will always remember the moments throughout the season that I had the privilege of growing close with the girls and boys within our football family. By decorating players’ lockers, going to team dinners, and riding on the bus, I had made so many amazing memories and even more amazing friends that I will always cherish. As a cheerleader, the most important part of my season is the support we received from the community. The boys work hard on the field to give us something to cheer for, and we work hard to get the community involved. 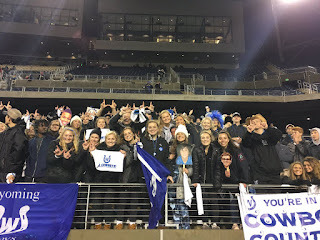 Thanks to the loving and supporting fans who show up, cowbells and Pom Poms in hand, the Wyoming community makes me proud to be a cheerleader. The bus caravan drove through the Wyoming Middle School parking lot which was lined with 600 students cheering. Many families took the morning off to cheer on the team with handmade signs. These eighth graders were excited to be out watching the busses instead of in class. Showcasing their new Wyoming scarf, this gang of fifth graders were getting into the spirit. The Wyoming High School Cheerleaders were leaders of the action creating signs and decorating the school grounds. Photo by Rod Apfelbeck. Seventy members of the Wyoming High School Marching Band were thrilled to travel and perform in Canton. Photo by Rod Apfelbeck. The Wyoming fans were rowdy (but super polite) in Canton. Photo by Rod Apfelbeck. The cheerleaders decorated the school grounds to get the community into the spirit.